They masterfully slather thick syrupy bass tones over pointed ever-shifting percussion, punctuated by the nimble, twisting guitar. Out of the swirling sounds, keys and synthesizers wail, cutting through the orchestrated chaos. Improvised Progressive Rock with an undeniably funky core is what these Little Rock, AR sound wizards do best. 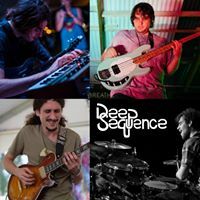 Utilizing the influences of Jam, Jazz/ Fusion, and Funk they’ve created a sound like nothing you’ve ever heard.